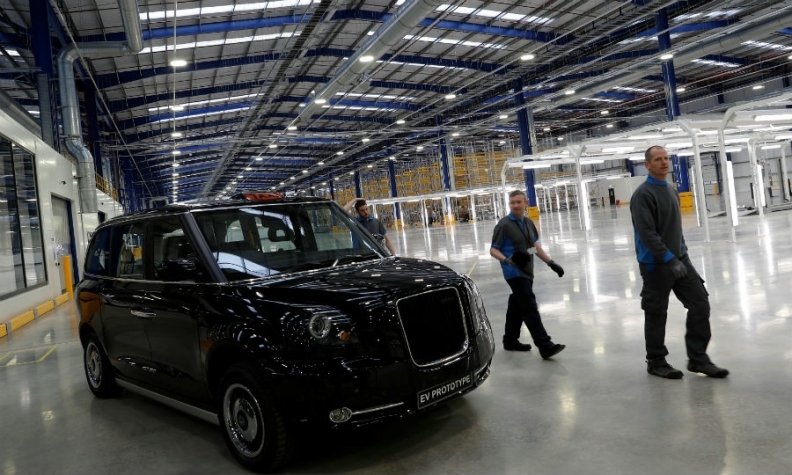 Workers walk past an electric taxi at The London Taxi Company's new factory. Hundreds of London's black cabs will start appearing on the roads of Amsterdam next year, powered by batteries instead of diesel fuel, marking the first international sale for Zhejiang Geely Holding Group's new electric taxi. Rotterdam Mobility Center agreed to a 225-vehicle deal for the new all-electric cab that will meet new pollution rules in the Dutch capital. It will be delivered from a factory near Coventry, central England, in the first quarter of 2018, the companies said Tuesday. The sale marks a new phase for London Taxi Co (LTC)., which is planning to expand its reach beyond the UK with its new battery-powered model called the TX that was designed in Barcelona and unveiled Tuesday. Starting in September, LTC will be renamed London EV Co. to reflect the 325 million-pound ($419 million) electrification investment by its Chinese owner Geely. That's paid for new manufacturing equipment for taxis and vans that will meet pollution rules being introduced in London and other cities worldwide. The cab's trademark turning circle and roomy interior suits the narrow streets of Amsterdam as well as requirements for wheelchair users, said Albert Donlou, director of services at RMC, in an interview. Designers were keen to ensure the "face" of the new cab conveyed a message that the driver was reliable and serious yet friendly, and was neither too cute nor too aggressive or retro, said David Ancona, managing director of Geely Design Barcelona. The interior can fit six passengers, compared with five for the current model, and features a large sunroof, as well as a large touchscreen for driver navigation. Geely wants to tap into the global market for low-emissions vehicles. More than half of new cars sold globally will come with a plug by 2040, led by cities in Europe, China and the U.S., according to Bloomberg New Energy Finance. "The launch of LEVC marks Britain's leadership as a first mover in creating the world's only dedicated electric vehicle company for the urban commercial market," CEO Chris Gubbey said a statement on Tuesday. LEVC unveiled the first version of the new cab, named TX. It retains key elements of the classic model, including doors that open backward to 90 degree angles and will be powered by a battery and a small gasoline generator, known as a range extender. That will allow drivers to travel from London to Edinburgh, or even Paris, without needing to refuel, according to the statement. The price tag of the new TX model will be announced on Aug. 1, when order books open for individual drivers, a spokesman for LEVC said by email. The new taxi will go on sale in London in the fourth quarter, and in the first quarter of 2018 in the rest of the world. Steep declines in the cost of batteries, that account for about a third of the cost of the vehicle, stopped the company from determining the price earlier. London's Mayor Sadiq Khan decreed that all new taxis in the city need to be capable of operating with zero emissions starting in 2018, either by pure electric or hybrid motors. As well as targeting London's 23,000 diesel-powered taxis, Geely has toured European cities from Paris to Berlin, seeking to drum up interest for a potential export market.